Samuel Kwasi Fabin, has quit his position as the head coach of Kumasi Asante Kotoko Sporting Club after taking charge for seven months, according to a letter intercepted by Otec Royal Sports. In a letter dated September 13, 2018 and signed by him, Paa Kwasi Fabin, it said his decision takes immediate effect to allow him assume his new role as a head coach at a newly promoted Maccabi FC, in South Africa. Paa Kwasi Fabin was employed in February this year to replace Englishman Steve Polack who was relieved of his duties after the team’s elimination from the CAF Confederation Cup qualifiers. His contract with Kotoko has three months to expire, and it is not certain whether it will be renewed by the new management. ”I want to thank the Executive Chairman for giving me the opportunity to work with him, the management team, the playing body and the supporters for their encouragement during the rough times,” the letter added. ”I want to thank the Executive Chairman for giving me the opportunity to work with him, the management team, the playing body and the supporters for their encouragement during the rough times. 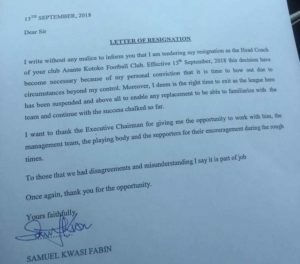 To those that we had disagreements and misunderstanding I say it is part of the job,” Paa Kwasi concluded in his resignation letter. He will leave his post immediately and thus will not be on the bench when Kotoko faces AshGold on Sunday in the return encounter of the ‘Golden Clash’. It is expected that his assistance, Akakpo Patron in will in charge, until a new head coach is employed, according to a source gathered by Otec Royal Sports.